Big news! We’ve just increased our winter coat inventory! Our Greytdogs Store is supplied with a lot of new coats. Some of them are our old favorites that seem to sell and sell; we’ve now made them available again. Others are new designs. We also have a new supply of sports team coats for those sports fans who like to show their team spirit. Check out our new inventory and you are sure to find something you like. 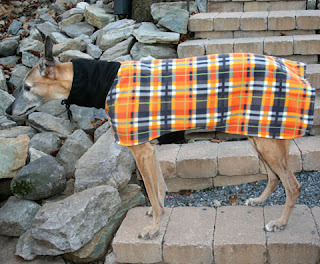 Of course, our diva coat model, Cassie, loved her recent photo shoot – she LOVES to model all of the coats herself. She knows exactly what to do and where to stand, etc. She has been our official coat model for over two years! You can even see the seasonal changes by looking at the backgrounds in the photos. No matter what type of weather, though, Cassie is willing to strut her stuff! Remember, all sales directly benefit our organization. The coats are all designed and made by Beryl Powers and she loves to see Cassie model the coats too. Thanks to Beryl for her hard work to benefit the hounds. You can go to our Greytdogs Store by clicking on the title of this post! Happy shopping!